Minecraft is all the rage (showing my age again? ack). I mean, even when it’s not all the rage, it’s still all the rage. My kids will play all kinds of games, watch all kinds of shows, but it always comes back to Minecraft. There is just so much to do on there! So Minecraft is a pretty good motivator on and off. 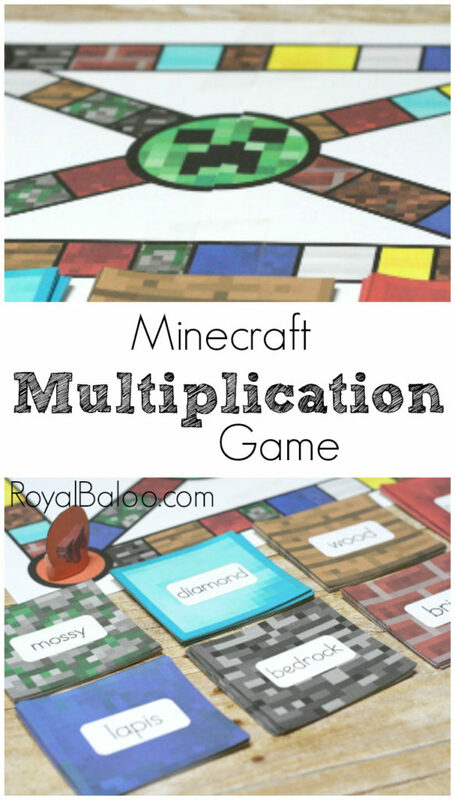 I teased about a Minecraft Multiplication game when I put out the Pokemon version…well here it is! 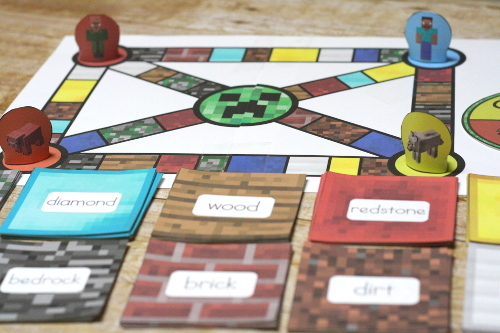 There are four player pieces – Steve, a villager, a pig, and a wolf. They all start on their color circle. 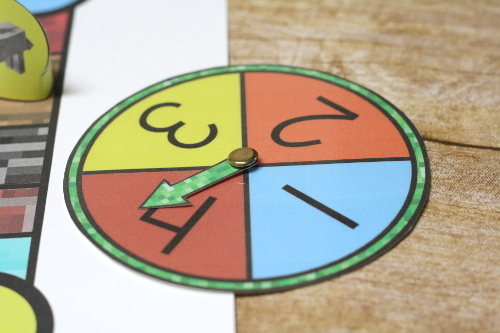 Each spin can take them 1-4 spaces in either direction. 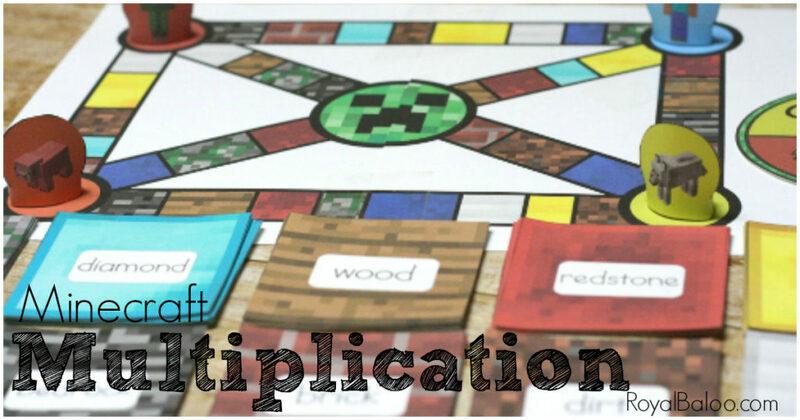 The goal is to go around the board until you land on each type of block and answer the multiplication problem on the back correctly. Each type of block has one fact on it – 3s, 4s, 5s, etc. I did 3s through 12s. I know I shouldn’t say this, but the blocks are so pretty!! Once a person has gather one of each type of card, they get to go up the path and into the middle. The first one to reach the creeper ones! One of each card. There are 10 cards – 10 types. It would be easy to play a quick round and just collect 5. If the game is going long people could also start trading. Adjust as necessary! My idea is just that this would involve a lot of multiplication fact practice but hopefully in a way that they’re still having fun! I think a cooperative version would be fun too. Everyone works together to gather all 10 block types. Something to think about! 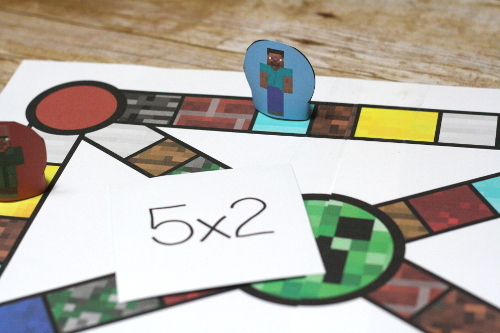 The game board is printed on two normal size pieces of paper. I used cardstock just because I wanted it to last a bit longer. Just line up the pages and tape together. 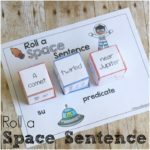 The blocks need to be printed double sided. Unlike the Pokemon game, I didn’t create a black and white version. 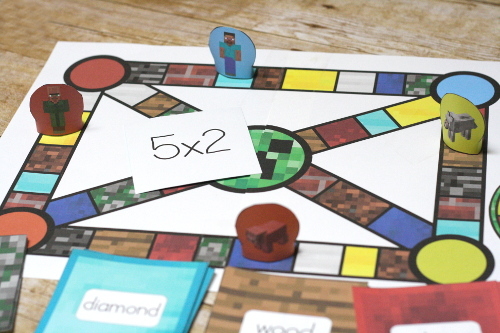 The blocks simply can’t be recreated with colored paper the same way. My kids are loving this game! 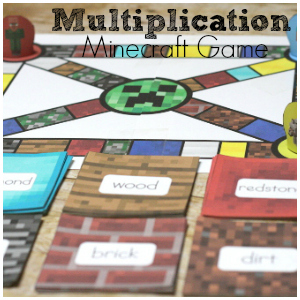 The first modification I made was instead of printing the multiplication on the back, I wrote both an addition and multiplication on the back of each card. That way my 1st grader can play with the kids working on multiplication, too (and my preschooler just had to tell us the numbers on the back of the card, so all of them could play). 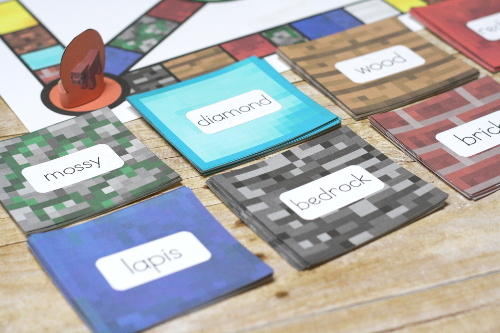 The other option to give some variety was instead of using the board, I printed off a list of items from Minecraft with the crafting recipe. Then the kids picked a random item and then collected the cards they needed to make each item. 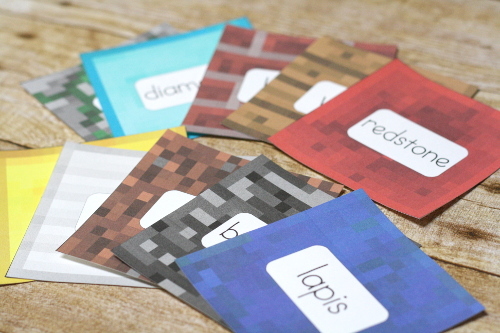 Once they craft an item, the cards go back to the piles and they keep the item paper to keep track of what they have made. Whoever has the most items at the end of the time, wins! Thank you so much for a great game! 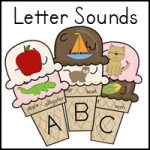 I just wanted to let you know that this was the BIGGEST hit with my third graders. Thank you!! I was a hero to them. I can’t wait to download the Pokemon one too. I have kids who refuse to go to recess and because they instead want to stay in class and play this game. Hi Elena! You have no idea how happy comments like this make me! I am so glad they loved it. If there is another theme that would be a hit, let me know! My kids aren’t always up to date on the latest trends so I feel like I miss some things.